Few people have been more instrumental to this website and the documentation of our community than Bekah Cope and Julia Bee. From 2009 to 2013, from Willy T’s house to the Stone Fox, from Saigon Baby to JEFF the brotherhood, Bekah and Julia have been there all along with their cameras in tow. Tonight, for the first time ever, they will culminate their greatest hits into a photo show for the public to enjoy. Prints will be sold, beverages will be had, and the ladies will be there to talk to the young people about their work. 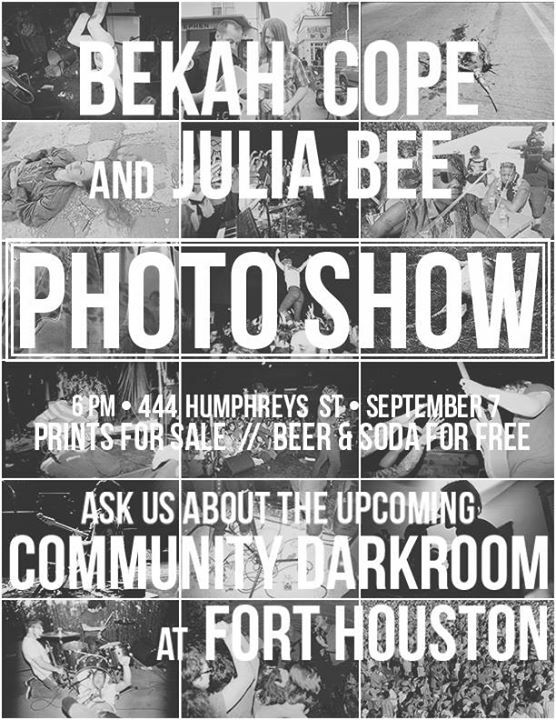 As the flier says, these babes are also in the process of setting up a community darkroom at Fort Houston, so find out all you can about that while you’re there. Don’t miss your chance to support the backbone.